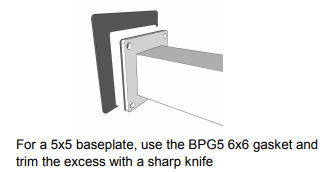 A baseplate gasket may be required to isolate the railing post from deck substrates such as pressure treated lumber. Always check with your local building code before installation. Step 1 Clean bottom of post baseplate of all oils, dirt and contaminates. Step 2 Peel white backing off gasket to expose adhesive surface. Step 3 Align top edge of baseplate gasket with the top edge of the baseplate and carefully stick on the gasket with the adhesive side of gasket making contact with post baseplate. Apply even pressure onto gasket until fully adhered. Step 4 Install posts as per railing instructions. 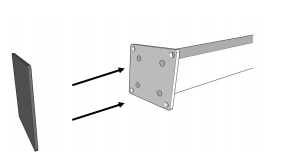 Post fasteners will self drill through the gasket. Note: It is important to align and install gasket correctly the first time as readjustment after initial installation may tear gasket.